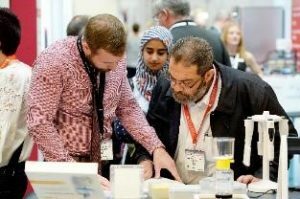 Twickenham, UK – 11th October, 2018 – Lab Innovations, the UK’s only trade show dedicated to the laboratory industry, will again host a range of laboratory introductions during the event at the NEC, Birmingham, on 31st October to 1st November. With over a third of exhibitors planning to launch new products and services in the UK at the show, Lab Innovations is the ideal location to see the very latest offerings for the laboratory at over 135 stands. From analytical tools and techniques, through general lab equipment and informatics, to larger scale industrial and cleanroom technology, Lab Innovations will be showcasing leading brands and novel solutions for all aspects of the laboratory environment. Visitors will also be able to find out more about the latest products and services at the show’s Live Lab theatre and SelectScience “Seals of Quality” awards. Included in the many new analytical products to be introduced to the UK at the show is HORIBA Scientific’s award-winning new Duetta absorbance/fluorescence spectrometer. Elementar will launch its new instruments for C and N measurements, the UNICUBE and UNICUBE trace, which feature a unique Temperature Programmed Desorption column for increased accuracy. Scientific Support Services will present the Vacuum Ultraviolet GC detector from VUV Analytics – the first new Gas Chromatography detector for over 30 years, making VUV spectroscopy accessible to the general scientific community. IKA Ltd will introduce the ROTAVISC series of highly functional viscometers to support quality control in all manufacturing processes, as well as in the research laboratory. To help streamline mercury analysis in a range of industries, Analytix is launching the Milestone DMA-80 evo high-sensitivity mercury analyser, which does not require sample prep, has a 5-minute analysis time and offers remote monitoring of analyses via the Milestone Connect app. Delivering significant improvements in the speed and quality of particle size, molecule size and zeta potential measurements, Malvern Panalytical will highlight its new Zetasizer® Pro and Ultra systems. New products that support routine laboratory functions include: Haier Biomedical’s intelligent Salvum Ultimate freezers, which reduce energy use while maintaining performance; and Pioneer PX analytical and precision balances from OHAUS. For precision liquid dispensing, Appleton Woods is showcasing its appPETTE single channel variable pipettes and Socorex will highlight its new Qualitix® tipfill system for quick and easy filing of pipette racks. Eppendorf will have a whole range of new instruments on show, including centrifuges, a large capacity biological shaker and CO2 incubator family. The Live Lab Theatre will provide an additional platform for laboratory suppliers such as GE Healthcare, Getinge, HORIBA, A&D Instruments and Lonza, to offer quick-fire practical demos and presentations on their very latest products for the lab. These range from liquid handling, balances and laboratory washing to biobanking, fluorescence spectroscopy and CRISPR solutions. Also, there will be an opportunity to hear about what Brexit may mean for the UK analytical laboratory through the presentation ‘Transition of Brexit and transition to ISO 17034’ by ESSLAB’s Managing Director, Cliff Marshall. Celebrating the laboratory products that scientists love most, the SelectScience Seals of Quality awards will also be held in the Live Lab Theatre on 31st October. Seals of Quality help scientists to quickly identify top-rated laboratory equipment, as they are awarded to the products that consistently receive the highest review ratings. These ratings provide peer validation of a product and support scientists when they need to make informed purchasing decisions for their laboratories. Easyfairs enables communities to “visit the future” at must-attend events that anticipate their needs and present solutions in the ideal format. The group currently organises 218 events in 17 countries (Algeria, Belgium, China, Denmark, Emirates, Finland, France, Germany, the Netherlands, Norway, Portugal, Singapore, Spain, Sweden, Switzerland, the United Kingdom and the United States). Easyfairs also manages 10 events venues in the Benelux, Netherlands and Nordic region (Ghent, Antwerp, Namur, Mechelen-Brussels North, Hardenberg, Gorinchem, Venray, Stockholm, Gothenburg and Malmö).